Everything I do comes back to Faeries. I can’t help it. They’ve been my obsession since childhood, possibly longer. So when I started my own business I tried to do things with Faeries. I say tried. I was quite successful in terms of writing about them, but when it came to my art… brick wall. I turned my hand to modelling. Nice, flesh coloured polymer-clay. Some sweet music. Cute little pixies on the brain… What did I get? A very particular type of Fae, and not the cutesy kind. Not the pretty-sparkles-with-bells-on that seems to appeal to the market I was used to. I’d spent years getting annoyed at the flufficisation of the Fae and here I was, trying to do it myself. So they put me right. 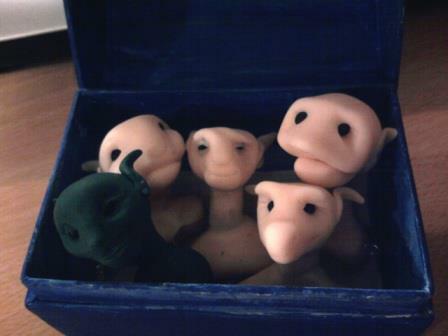 But what on earth was I to do with a tribe of Goblin heads? Put them in a box for a while, unfortunately. I wasn’t ready for them. “We are the spirits of nature,” they said. “And you are a natural beast, right? I’ve learnt an important lesson: your guides are not necessarily your tribe, you may be pixie led but that doesn’t mean they’ll stay for tea. At least, not until you reach your destination and turn around to find that they’ve followed you in, pulling faces at the back of your head all the way! Last September I was writing about power and niceness. I was wondering what it was about being seen as ‘nice’ that I was so focussed on to the point where I’d let myself down. Why was I scared that people would think I wasn’t *nice*? To be honest, I am nice, generally speaking. And goblins aren’t necessarily nice. They’re not necessarily not-nice either, to be fair. They played on my mind. They poked my brain. They reminded me that sometimes it takes being seen as not-nice to take back one’s power. That November Thought Bubble, the comic con in Leeds, rolled around. And I met Dr Geoff. In particular, I met his tea museum. His awesome, fictional, steampunk, tea museum. The Goblins liked this. They liked it so much they started jumping up and down and would NOT be QUIET! They told me a secret. They told me that “The Goblin Circus” was coming to town. And that I was to present it to the world like Dr. Geoff presents his tea museum. In tangible, physical form. And in the way I do best, through stories. I’d come home. I’d found the treasure that is my Faery Magic in the core of me. A creative performance full of colour and stories and laughter and inspiration. I turned around with my treasure to carry it back into the world so I could share it. There they were, all the Fae that had led me this way and then slipped into the shadows. They’d followed me all the way into the Goblin’s home, and now we were going to take that wilful playfulness out into the human world together. The Pixies laughed and said they’d come dance in the circus. The nymphs started singing songs for us to learn. The dryads gave us lessons in how a Big Top grows. They all started bringing me stories to play with, to model my Circus tales on. The Goblins and I got to work. I began drawing a comic. That didn’t quite work, so I did as they’d suggested and worked on my oral storytelling instead. Imbolc dawned and I found myself on stage in a top hat, with an audience of about 75 humans, for the Goblin Circus’ opening night. A one-woman-many-goblin circus was born. So far it seems to be going well. We have a 30 minute storytelling show, a website, local performance gigs lined up for the summer, a rapidly expanding human crew… and that comic has reinvented itself. Six inked pages finished today. When I stopped focussing on what I thought I wanted and who I thought I was, I found my stride and it became clear. Everything I do comes back to Faeries. It just so happens that the kind of Faeries that were holding onto my power were Goblins, rather than flower fairies I’ve been shown by the world since I was small. Oh, and not only that but as the Circus took shape my writings on the Fae, on their logic and our Faery hearts, was picked up by a publisher. I got a book contract to share with the world the magic the Faeries gifted me with. That magic lead me home to the ever-evolving Goblin Circus, I wonder where it might lead you? This entry was posted on Tuesday, April 14th, 2015 at 10:28 am	and tagged with faeries, goblins, Halo quin, magic, steampunk and posted in Guest Blogger. You can follow any responses to this entry through the RSS 2.0 feed. Thanks for sharing my story, Nimue!